Dan Dressler will be exhibiting a collection of abstract watercolor paintings at the Newton Free Library. Works will be on display and for sale from February 2nd - 27th. The Reception will take place on February 5th from 7-8:30pm. Refreshments will be served. 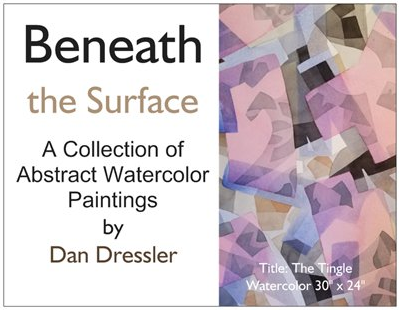 Contact Dan Dressler @ visualart@dandressler.com to purchase a work from the Beneath the Surface collection. Beneath the Surface filters raw emotion into visual expressions that are abstract in nature, providing the viewer with a subjective experience. Reflecting on the human condition this collection of paintings focuses inward, beyond the calm physical exterior. Layers of translucent color, tonality and hard edged imagery work together to establish figure ground and spatial ambiguity. Dressler describes his creative process as an ongoing conversation where one mark informs the next. Working extemporaneously, he attempts to maintain his focus on the edge of awareness where emotion and cognition collide.